You'll feel the electricity of this famous film-oriented playground on the French Riviera from every corner of the chic Hotel Martinez. In this palm- and cinema-studded city of glam and glitter, which has seen more than its share of rising stars come and go, one thing has remained fashionable and respected through the decades—the venerable Hotel Martinez. Built on the famous Croisette bordering the lovely seafront of Cannes, this icon of European Art Deco society has evolved from a popular winter resort hotel of the late 1920s to its current iteration as a luxurious place to unwind year-round, with 412 sleek guest bedrooms and suites featuring warm carpets, rich fabrics, and unexpectedly modern accoutrements. Its sea views are legendary, and its little slice of the French Riviera is picture-postcard perfect. Just spend an afternoon at the hotel's private beach club, Zplage, relaxing under the shade of a crisp white umbrella or dipping your toes in the azure sea, and you'll understand the attraction of this idyllic setting. Other luscious attractions lie around every corner, including the Spa Martinez, where you might enjoy an Aquamilk Facial or Sea Salt Exfoliation, and the two-Michelin-starred La Palme d'Or, where you could find yourself dining al fresco on the freshest seafood imaginable one table over from your favorite movie star. 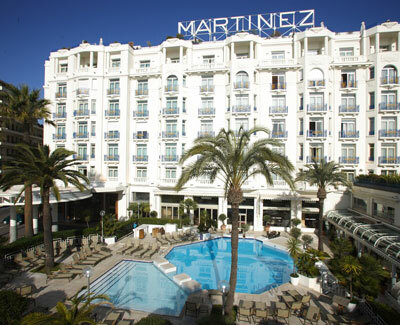 Speaking of movie stars, the crème de la crème of film actors and directors flock to The Hotel Martinez each spring for the Cannes International Film Festival, an event that was launched in 1946 and continues to draw crowds of BYTs (Beautiful Young Things) each year. Cozy up in the lobby with an aperitif to watch the string of limousines coming and going, picking up and letting off the likes of Scarlett Johansson, Penelope Cruz, Sharon Stone, Quentin Tarantino, Clint Eastwood, and Frances Ford Coppola—all just part of an evening?s entertainment at this exquisite palace hotel on the sea.